Semantic Pragmatic Disorder, now more commonly known as Pragmatic Language Impairment (PLI) describes an impairment in understanding the ‘pragmatic’ areas of language; that is to say, the way in which context contributes to meaning, overcoming ambiguity and understanding inferred meanings. This kind of difficulty with communication has seen Pragmatic Language Impairment associated with Asperger’s Syndrome and autism. In fact, many children with PLI have mild autistic features, such as difficulty with imaginative play and social situations, and those who definitely have autism also tend to have this kind of language disorder. In normal circumstances, developing an awareness and understanding of the semantic nuances and sub-contexts in language is a challenging enough aspect of language learning. Usually, an understanding and comprehension is achieved through academic study, and experience from social contact and conversation. But those with Pragmatic Language Impairment are thought to actually have an underlying cognitive impairment that means that they continue to have difficulties with language in this way. Children with Pragmatic Language Impairment may develop their language skills much later, whereas children with Asperger’s Syndrome are often able to speak in sentences around the age of three. 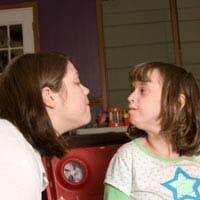 Children with PLI are still able to become fluent talkers, but struggle with reading and language comprehension and may display some traits as a result of their condition. Because the most basic characteristic of PLI is the individuals’ continued lack of understanding of the meaning of what other people are saying (semantic), they often become pathologically talkative. But they are often unable to conceive what is considered appropriate or offensive in social situations (pragmatic), and can frequently misunderstand and misinterpret what has been said, especially when jokes, stories or satire are involved. This in turn can lead to inappropriate feedback that appears to be off-topic, or an inability to understand and answer certain questions. People with PLI can often memorise phrases but use them completely out of context. In addition, PLI may also cause aphasic speech, where speech is slow and long pauses are made as the speaker attempts to find the right word to use. People with PLI may often have difficulty in communication their thoughts, opinions and needs – in some cases, this may lead to social exclusion if not addressed. People with PLI do not necessarily just grapple with the meaning and context of verbal and written language; they may also find body language difficult to interpret and understand. This is partly why for children with PLI, imaginative play can seem confusing and even frightening. As with those with mild autistic features, children and adults with PLI may lean towards solid, fact-based or logical interests and more rigid routines, despite sometimes displaying poor organisational skills. As a developmental disorder, some traits may improve with age and experience.Although children with PLI display some mild autistic traits, they may be able to continue with mainstream education with the appropriate support in place. This may be in the form of classroom support or extra language units with speech and language therapists. Many go on to become articulate, fluent talkers with a comprehensive vocabulary, but will often be much more adept at talking than with actually understanding the meaning of what it being said.